Best Sign Up Offers for Online Sportsbooks - We Found Them! What Are The Best Betting Sign Up Offers? Exactly what are the best offers to make that wave of cash come this way? Q: I’m looking for a sportsbook that offers the best betting sign up offers. Which one should I go with? 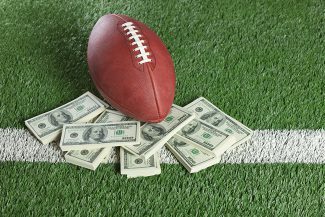 This is a very common question as many sportsbooks are offering very attractive sign-up bonuses, but there are usually a few catches with them, namely rollover requirements. Usually, if a sportsbook is offering higher sign-up bonuses, then they’ll probably have a higher rollover requirement… Or they could just be a shady organization trying to scam your money. We recommend only going for the most reputable sportsbooks. In order to determine the best betting sign up offers, we need to first understand rollovers. You’re about to learn the best sign-up offers, but do you know why Sports Betting is the best career ever? Also up for an honorable mention here is Sportsbetting.ag, currently offering a 50% Welcome Bonus, a $200 Refer A Friend Bonus, and a 100% Crypto Bonus! Different sportsbooks will have different rollover requirements, for instance, 5Dimes has a 10x rollover requirement. Other sportsbooks may have a 5x rollover requirement whilst overs might have 15x. The rollover requirement will always be stated in the website’s terms of service. The higher the rollover requirement, the more you will have to bet in order to withdraw your bonus. First, take the amount of your initial deposit, let’s say you deposited $200. Now, calculate the bonus you will earn (this will depend on which sportsbook you are using). For this example, let’s say we are using Bovada. Bovada offers a 50% match bonus of up to $250, so in this case, the bonus is 50% of our initial deposit, $200. So the bonus is $100. Combining these two, we get $300 (our initial deposit + our bonus). Now calculating the rollover requirement is easy. Just multiply this number ($300) by the rollover requirement. Bovada has a 5x rollover requirement, so the amount you have to bet in order to get the bonus is $300 x 5 = $1,500. Whenever a sportsbook has a low rollover requirement, often times, they also apply a time limit, say 30 days, for you to complete the rollover. If you fail to complete it in time, your sign up bonus will be forfeited. This might be a problem for those who just want to bet every once in a while. Also, keep in mind that sportsbooks can have differing rollover requirements for their sports betting section and casino betting section. For Bovada, the rollover requirement for sports betting and horse racing is 5x, but the rollover requirement for their casino section is 25x. Make sure to keep this in mind if you’re planning on casino betting. Which Sites Offer the Best Betting Sign Up Offers? 50% match bonus of up to $250 with a 5x rollover requirement. No time limit or other special requirements, but is only available to US bettors. The reason Bovada is our number one choice sportsbook is that the bonus is competitive, easy to understand and highly achievable even for beginners. Other sportsbooks have much more strict requirements which can be tougher to win for beginners or recreational bettors. You can’t deposit via Skrill or Neteller if you want to claim the bonus. Players from Russia, Bulgaria, Greece and Serbia cannot qualify for the bonus. No withdrawals can be made within 30 days if you claim the sign up bonus. BetOnline offers large bonuses, but for a higher rollover requirement. This offer is great for those who are looking to bet bigger numbers or over the long term. I want that pile of money right there. Joining up with Bookmaker can currently get you an extra $1600 with them. It works out to be (up to) $600 for use with the Sports side of the site combined with (up to) $1000 for use in the Casino. Rules attached of course. Sports bonus has a 5 time rollover (on deposit amount + bonus) before any payout can be requested. Some people like sports more than casinos. If you happen to be one of these people then keep in mind that it is possible to claim the sports bonus and turn down the casino bonus. 5Dimes is an odd one. As stated in another article of ours, their site looks as though it has not been updated since sometime in the late ’90s. This still stands true, but this is also true – they really know their stuff! If you were to take a look at their site you would find a whole mess of great options, but you have the option to turn them all down in exchange for reduced juice all the time! Reduced juice options are generally posted on the day of the event. Unfortunately, Cloudbet is not available for us players in the good ol’ US of A, but when discussing the best sign-up offers you cannot exclude them. They’re a fairly new bitcoin Sportsbook and Casino offering up an insanely huge 100% match bonus up to 5 BTC! As of this writing, that’s just a fuzz over 18 thousand dollars! We dare you to go find a better offer than that! 0.01 BTC get released for every 800 loyalty points you earn. These 0.01 BTC increments will appear directly in your account, up to the maximum of 5 BTC. They will give you a year to earn all the loyalty points needed to release the entire bonus. Hopefully, after reading about some of the greatest sign-up offers around, you’re ready to move on and go win some dough. But what if you’re a Nervous Nelly and you’re still not sure? That’s okay. We’re still here to help you out in any way we can. You can always get an actual full review of all of these Sportsbooks and more by clicking on this link right here! Speaking of Crypto… Want to See About Some Sportsbooks That Gladly Accept it?